The Tenth Annual Edition of the ProSoundWeb Readers Choice Awards (RCA) voting ends January 8th. Be sure to check it out and vote for your favorite products! Voting is still open in the Tenth Annual ProSoundWeb Readers Choice Product Awards. Go here to check it out and vote for your favorite products. 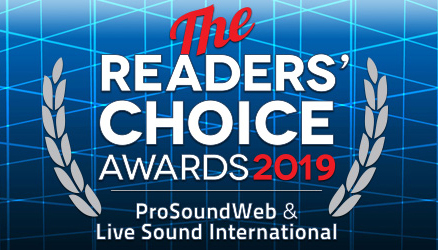 The Readers Choice Awards (RCA) is unique for a number of reasons, chief among them (and as the name says), all voting is the exclusive domain of the readers of ProSoundWeb. More than 250,000 votes have been cast in the RCA over the years. The races in each category are invariably close and competitive, owing to the overall strength of every product entered combined with the distinct yet varied preferences of the pro audio industry’s largest online community. In fact, many races are separated by just a few votes, so every vote does indeed matter. Several new categories have been added this year’s RCA, providing even more opportunities to honor deserving products. Voting is open through January 8 (2019), so don’t miss this opportunity. Note that all participants are limited to one voting session only. The awards will be be presented at the 2019 NAMM show, January 24-27, in Anaheim. Again, go here to vote in the Tenth Annual PSW Readers Choice Awards.